This was a good week. 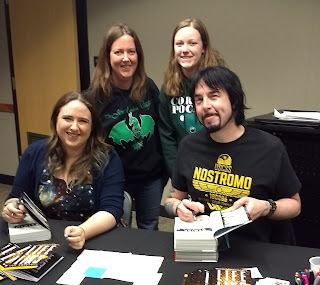 I was lucky enough to get to go to the Obisidio event last Saturday with my daughter and had a great time. I spent most of my week at work trying to get caught up with everything since I have next week off. I am so happy to officially be on vacation right now. We are going to be very busy this coming week since we are tying to fit in a lot of college visits. It is hard to believe that it is time to start making those kind of decisions. I love Harry Dresden so requesting Brief Cases was a no-brainer for me. I can't wait to start reading this collection of Dresden short stories. 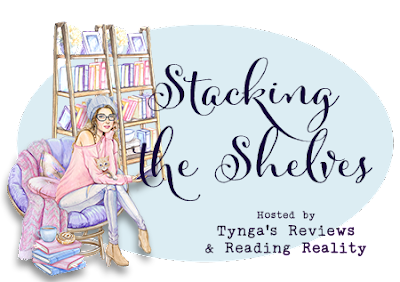 I finally got around to downloading Nothing Left to Burn from First to Read and hope that I like it as much as some other bloggers have. 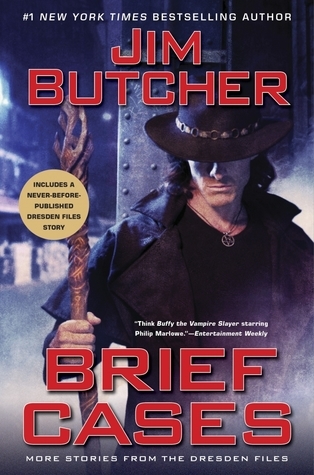 It has been a while since Jim Butcher released a new Dresden book so I was excited to see this one on NetGalley. I actually like the cover of that book the other one...not so much. Yay! Glad you got to meet the authors of Obsidio! Hope you have a great week! That Obsidio signing was awesome!! Hey, did you by chance ask Amie what those three lines were that she had to add in? I totally forgot to do so in all the excitement when I got to their table! Oh neat to go see the authors. Wishing you well on your college visits. I want to start the Harry Dresden series at some point. I have read most of the Harry Dresden series and really do love it. I am not quite caught up but think I will be okay with this book of short stories. Glad you got to see Amie and Jay. I saw Amie and Meghan Spooner in January, and Amie is hilarious! I had such a great time at the book signing. Amie and Jay were both amazing. I love the photo! Good luck with the college visits, and have a great week! I'm glad you had a good week...mine has been fine but a bit lazy! I plan to watch TV the rest of the day and night and enjoy it! That is awesome you got to go to the Obsidio event!! Yay for vacation and good luck on the college visits. Have a great week!! I hope you have a wonderful vacation! Visiting colleges . . . That brings back memories. :-) Someday I imagine Mouse and I will be doing that as well. That is so cool that you got to go to the Obisidio event! I am looking forward to Brief Cases too. :-) I hope you have a great week, Carole! We have quite the busy week planned with tons of college visits. We did one today and it wore me out! Your latest haul looks great. Enjoy. And, good luck with the college app process. And quite a process it is. We aren't even at the point of applying. She just needs to figure out where she might want to go. It is a tough choice. I think that I need to read a book or two to catch up with the series but I think I will be okay with this book of short stories since most have been previously published. I haven't read either of those. Hope you enjoy. I have heard great things about Nothing Left to Burn and Jim Butcher has been consistently good for me so I am hopeful this week. I bet you had a nice time-that is so cool that you and your daughter went together,that's a great memory!! I haven't read those books either but I hope you like them!! I was actually kind of surprised that she was willing to spend her Saturday night with me instead of her boyfriend. It was a good memory. It looks like you and your daughter had a great time. You look so much alike - both beautiful. Have fun on your college visits. I think my parents sent me on mine alone - well, my best friend went too. Hope you enjoy your week off! Thanks, Barb! One of our visits this week will be quite the drive. I am glad that we are able to check out these schools with her and she wants us to help make her decision. Glad you had fun! Also, hope you enjoy your vacation. I tried getting Nothing Left to Burn. It looks so good. Will look forward to you thoughts on it! 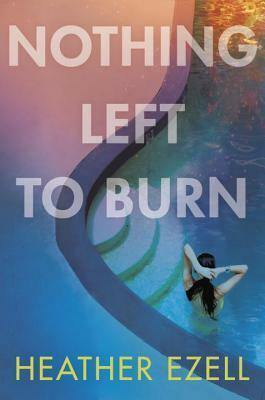 I hope to start reading Nothing Left to Burn soo. Thanks, Aleen! We have done 2 visits and have 2 more planned this week. Tough decisions! Oh great for the Obsidio event! Some interesting books for you. I only know of Jim Butcher. Happy reading! I feel really lucky that there was an Obsidio even in my home town. That there is the coolest photo ever, congratulations!! :) and I like your haul :) I hope you have a great week! Awesome picture! Good luck with the college visits. It feels like forever ago since I had to drive all over for that. Is you daughter going for an performing arts program? I remember having to drive all over the place for portfolio reviews. If that is her route, then you'll have auditions too. Nothing Left to Burn looks fabulous. They actually had some great books through First to Read, but the format is a struggle. I am just going to hope my library gets the books, because Penguin already mass rejected all my DRC requests. My daughter want to be a band teacher so we are looking for a school that has a great music program and hopefully a marching band since she really wants to continue with that if possible. First to Read is a good program but I do wish that I could get the books on my kindle. I have a 10" Samsung tablet that works well for it otherwise, I honestly wouldn't mess with it. Sometimes the books just don't seem to want to work and end up being unreadable. I can't wait for the new Harry Dresden book. I will wait and get the audio. I can't pass up James Marsters. Good luck on your college visits. I hope you find the perfect fit. The event sounds amazing! Kids grow up so fast don’t they?! Have a great Sunday! Oh goodness. Hope the college visits go well! So far so good, Anna! That is so cool that you got to meet Amie and Jay! I wish I could have gone to one of their tour stops. OMG, you and your daughter look exactly alike. :D I hope you enjoy all of your new books! We are pretty lucky in the St. Louis region to get quite a few great authors. Thanks, Alyssa! OMG, next year is that time for us to be making those kinds of decisions. My daughter is a junior. I know how you feel - where did that time go?? Please TELL ME!!! Have a great week reading and off of work! My daughter is a junior and it is really not too early to start looking. Early applications are usually due during the first semester of senior year. My daughter is so busy with marching band at the beginning of the year we need to have a plan in place before things get crazy. That's great you were able to attend the Obsidio event. I hope you had a great time. I need to re-read those first two so I can finally get Obsidio. I have only read the first one and read that as an early copy so I really need to re-read it before moving on. I think I will be adding the audiobooks to my collection for the re-read. College visits! How exciting and bittersweet. I do imagine you have a crazy week ahead of you. I really need to read some of the Dresden books. I've heard raves about the series but have never read even one. That is such a great picture! Enjoy your week off and I hope you can squeeze in some fun between all of the college visits. Thanks! We have been pretty busy so far. I am just hoping that I get some time to recover. Author events are so much fun!